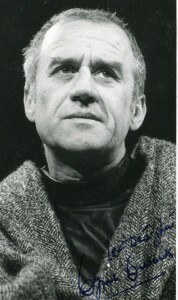 The great Irish actor Cyril Cusack (1910-1993), who was well known internationally and highly accomplished on both the stage and the screen, performed in a double bill of Krapp’s Last Tape with Shaw’s Arms and the Man at the Abbey Theatre in Dublin in 1960 (Note that Abbey productions were at this time still being presented at the Queen’s theatre following the fire of 1951). Cusack, an actor whose career spanned almost the breadth of the 20th century, first performed on the stage at the age of 7, and seems to have had a deep interest in Beckett’s work, particularly so in the 1950s and 60s. A few years prior to this production of Krapp’s Last Tape, he had written to Beckett looking for permission to do a bilingual version of Waiting for Godot. In May 1955, Beckett wrote to him giving his permission for this planned bi-lingual adaptation of the play at the Abbey Theatre. Cusack’s vision had the play set in Connemara, with Vladimir and Estragon speaking Irish to each other and English to Pozzo and Lucky ‘as is the familiar pattern in Gaeltacht areas’. Cusack recounts much later that Donald Albery’s resistance to Godot being produced in Dublin in English made him, in temper, suggest this measure. Beckett gives him the necessary contact details for the rights from Editions de Minuit but seems somewhat bemused by the request writing, ‘By all means do it in Gaelic in Dublin if you think it worth while. Why parts in English?’ This particular production, with all its postcolonial resonances, never materialised; Cusack went on to play Krapp at the Abbey and later made a recording of readings of Molloy, Malone Dies and The Unnameable (Caedmon Records, 1963). A programme for Cusack’s production of Krapp’s Last Tape is held at the Dublin City Library and Archive and no doubt some new material will come to light through the Abbey Theatre’s digitisation project at NUI, Galway. Reviews for this production suggest some disappointment, with Krapp’s Last Tape in particular. Yet this was down perhaps to the strength of the production which preceded it. One reviewer had the opinion that, coming after the ‘tour de force’ of Arms and the Man (with Maureen Cusack and directed by Godfrey Quigley), Krapp’s Last Tape was something of a disappointment: ‘Mr Cusack laboured the early earthiness and the grotesque, bewildering the audience, leaving them uncertain how to take the poetry, and tempting them perhaps to seek an easy refuge in his virtuosity.’ Yet, negative comments aside, this doubly-billed production clearly had appeal; after playing in Belfast at the Empire Theatre and in Dublin, it went on to represent Ireland at several European festivals of drama. During what was a month-long tour of Europe, Cusack’s performances won him the individual award for best actor the International Festival in Paris. ‘Best Actor Award for Cyril Cusack,’ Irish Times, 14 July 1960, p. 1.